Evernote wants to be your brain in the cloud. More than 'just another update', the latest version of Evernote for Android is an important milestone. A big achievement for Evernote's design team, over their long history of iterations? Maybe not -- has anybody used every version, on every platform? 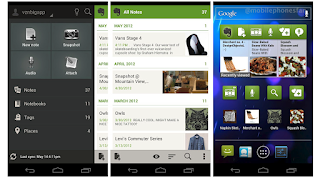 But Evernote 4 for Android is a clear landmark in the history of Android as a mobile OS. Yes, MobilePhonesFan believes it's a really big deal. No exaggeration. Because Evernote 4 embraces the 'Holo' UI theme from Android 4.0, 'Ice Cream Sandwich'. And their designers have done so in thoughtful, thorough fashion with no lingering trace of Gingerbread to be found. The result is a remarkably smoother user experience -- e.g. : less 'back' key, more swiping -- as well as a more handsome app, overall. So, that's cool...another improved app. No matter which ecosystem we prefer -- Android, iOS, Windows Phone, etc. -- we all hope to see a steady stream of bigger, better apps flowing from a burgeoning list of 3rd-party devs. But let's set aside all the obvious benefits of such digital keiretsu, because that isn't the big news, here. What's important is who did it: Evernote. Think about that for a moment. Can you name any other 'Top 10', multi-platform app that's been treated to a full-bore Android ICS makeover? We can't. And that's news. They didn't go with a quick, cheesy port of their existing iPhone client. They didn't get lazy, slapping a thin coat of Holo paint on their old Gingerbread app. Kudos to Mark Stout and team. Matias Duarte should be well pleased.